Congratulations! You’re a 2016 Rio Olympics medal-winner! Quite the difference from being, say, merely a lottery-winner, gained from sheer dumb luck – admittedly in the face of odds heavily stacked in favor of the House – rather than years and years of training to get to the top of your chosen branch of athletics. In actuality, though, there’s often no difference at all between the two. It simply depends on your country’s particular tax-regime You’ve just very publicly received a nice chunk of money, after all, whether via dumb luck or no. A government – often more than one – is likely interested in demanding a piece of it. 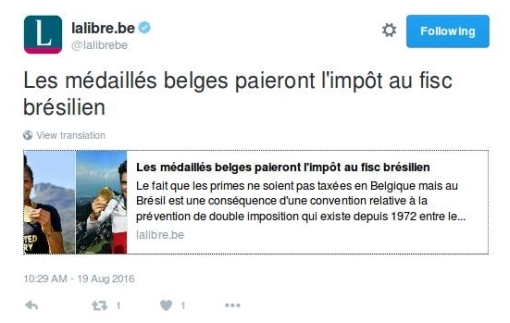 As you see, the Belgian paper La Libre Belgique recently devoted a bit of space and one of its writers (no by-line) to this issue of the tax-status of the money its athletes gain win they win Olympic medals. First of all, such prizes are paid by the national federation of the athlete, so they differ by country. For Belgium the pay-outs are as follows: (for individual events) €50,000 for gold, €30,000 for silver and €20,000 for bronze; for team events, it’s €12,500/€7,500/€5,000. Further individual event competitors who place fourth get €10,000, fifth get €5,000. At least this means that taxation on these winnings will be determined solely by an athlete’s country of nationality. Here the anti-Double Taxation treaty Belgium concluded with Brazil back in 1972 prescribes that such finanical gains for Belgians operating in Brazil will be taxed according to the Brazilian authorities, and not again by the Belgian government. But, to repeat, the Brazilian authorities have waived any tax. So Belgian athletes are in luck. The La Libre Belgique piece also claims there is no anti-Double Taxation Treaty between the Netherlands and Brazil – surprisingly. So Dutch athletes do have their winnings taxed, as income. And the HFD piece (behind paywall) also states that the prize-money amounts are less there: only €19,125 for an individual gold, €12,750 for silver, €9.350 for team gold. Of course, presumably there is support from the Dutch athletic federations (probably underwritten to some extent by the government) for training and being able to live without a day-job during that training, but that is surely the case in Belgium as well.